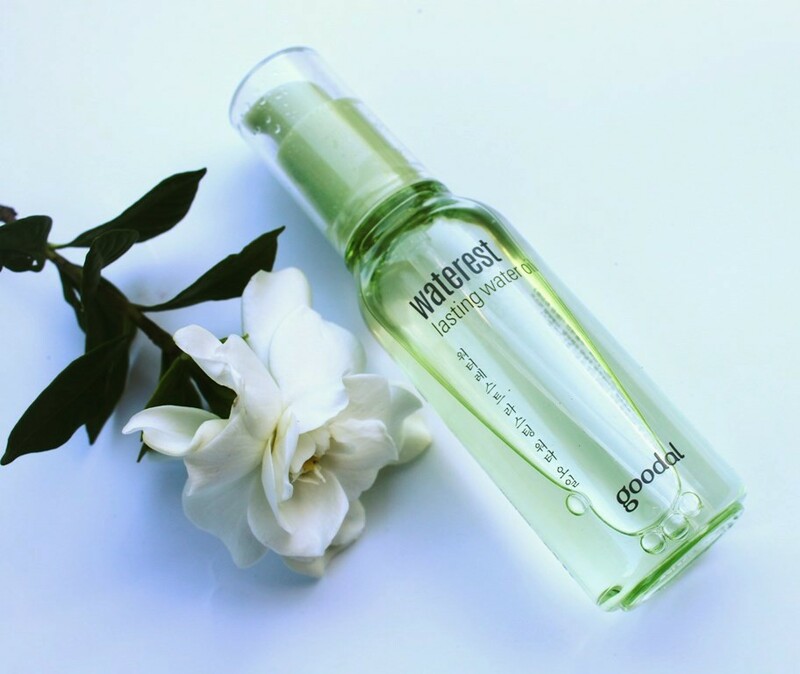 The Goodal Waterest Lasting Water Oil is a moisturizing oil that fills skin inside and out with moisture. 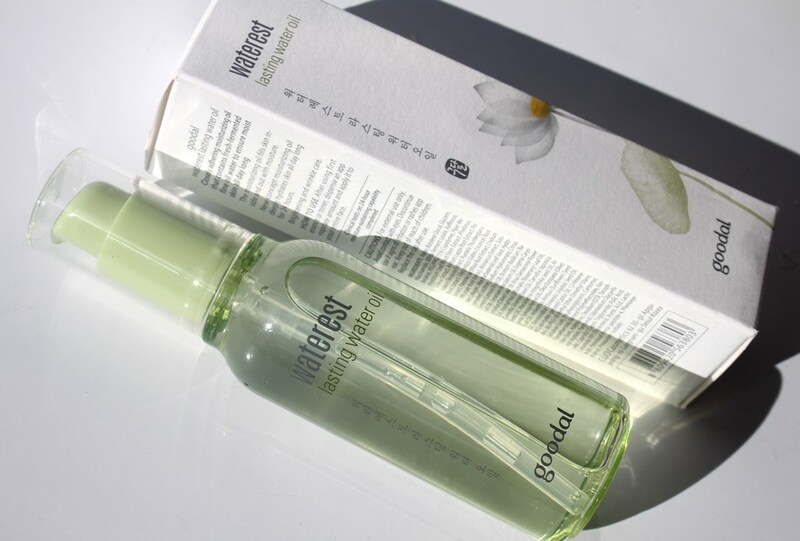 A new-concept moisturizing oil that deeply hydrates skin all day long for 24 hours. Also contributes brightening and wrinkle care. Being a water oil, it’s not surprising that water is the ingredient found at the highest concentration. Next, one of the best represented actives is Niacinamide, a well tolerated form of Vitamin B3 which offers several skincare advantages. It strengthens cellular bonds, stimulates collagen and tightens the outer skin layer for both a firming effect and to discourage acne formation. Additionally, it’s an excellent hydrator exhibiting similar effectiveness to hyaluronic acid and performing better to retain moisture than Vaseline, one of the most occlusive moisturizing agents. Due to its ability to inhibit melanin production, another of its many benefits is lightening. 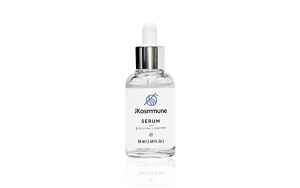 It is an effective treatment against hyperpigmentation at concentrations of at least 2%. Niacinamide, together with Licorice Root, Cnidium Officinale Root and Peony Root extracts, provide a strong defense against the appearance of discoloration and age spots. Next up, Bifida Ferment Lysate is the resultant yeast obtained by the fermentation of Bifida which strengthens the skin barrier. It displays soothing properties, able to reduce inflammation and redness whilst also improving hydration and skin elasticity. A significant number of natural extracts deliver impressive soothing effects through their antimicrobial, anti-inflammatory, antioxidant and antifungal properties, often demonstrating a positive outcome for eczema, acne and other skin conditions. These include Mesima (Medicinal Mushroom), Purslane, Kava Kava, Burdock and Kudzu Root Extracts. Meanwhile, moisturing and hydrating properties are contributed by Aloe Vera Leaf Juice, Soybean Ferment Extract and Sodium Hyaluronate. Goodal claims that the formulation includes a 7 Super Seed Oil and Bio Gum Complex to aid absorption and deep penetration into the skin for 24 hour hydration. This oil combination comprises sunflower, jojoba, camellia, gree tea, argan, olive and macadamia oils whilst the bio gum complex creates a protective seal to prevent moisture loss. Fatty acids found in these oils contribute moisturising and emollient effects for softer, more supple skin. Exceptionally high in oleic acid, the seed oils of Japanese Tea and Macadamia are light, regenerating, moisturising and quickly absorbed into the skin. Both Olive Oil and Argan Oil present hydrating properties enhanced by the added strength of antioxidants. Rich in linoleic acid, Sunflower Seed Oil can help maintain the skin barrier and decrease transepidermal water loss, keeping skin moisturised for longer. Jojoba Seed Oil is non-greasy, lightweight, antibacterial and anti-inflammatory making it ideal for the treatment of skin disorders such as acne. Similar to sebum in structure, it is readily absorbed into the skin to deliver softening and moisturising effects. Tea Plant Seed Oil is considered the beauty secret of the traditional Japanese geishas due to its highly restorative and rejuvenating effects. Natural oils also assist to detoxify pores, balance skin oils and fight acne. The citric acid within Lemon Fruit Oil is a skin hyperpigmentation agent. It boasts anti-inflammatory and antiseptic properties which help replace damaged melanin cells resulting in a brighter complexion. Antioxidant activity makes Rose Oil effective at fading dark spots and accelerating healing. Similarly, Rosemary Leaf Oil displays antibacterial properties which stimulate cell renewal proving an effective treatment for problem skin. Some oils such as those derived from lemon, basil, rosemary and clove are known to irritate sensitive skin so caution should be exercised if introducing this product to reduce the possibility of an adverse reaction. There are a handful of additional powerhouse ingredients in the formulation. Present in all living cells, Panthenol, a provitamin of B5, is deeply penetrative acting to hydrate and moisturise. It can also reduce inflammation and soothe skin conditions. Together with its absorption properties it is sometimes used to treat acne. Similar properties are observed in White Licorice which is said to improve dry and damaged skin by restoring suppleness. Furthermore, clinical tests claim it is an effective treatment for atopic dermatitis with studies also indicating success with reducing redness and irritation caused by rosacea, psoriasis and acne. Due to its ability to inhibit tyrosinase activity and melanin production, it lightens and brightens the skin and prevents hyperpigmentation. Ceramides are necessary for their water-retention capacity. They help to provide replenishing and restoring benefits. Already present in the skin, Cholesterol helps to boost the skin barrier and in doing so, keeps it hydrated. The aftereffect is a welcomed reduction in the signs of ageing. Lactic Acid is an Alpha hydroxy acid (AHA) which exfoliates the skin surface, ridding it of dead cells to promote radiance. Created by the Sederma laboratories, Palmitoyl Pentapeptide-4, also commonly called Matrixyl, is a proven wrinkle treatment more gentle than retinol. When present at fair concentrations, these actives are highly effective however, their very late position within the ingredient list indicates that they are only included at minor or trace concentrations. As such, their impacts are likely low or negligible. The water oil comes in a light green tinted plastic bottle with a pump lid and cap. Their are a few hazard warnings although no red flags raised in the CosDNA and EWG reports that result in an overall moderate rating. 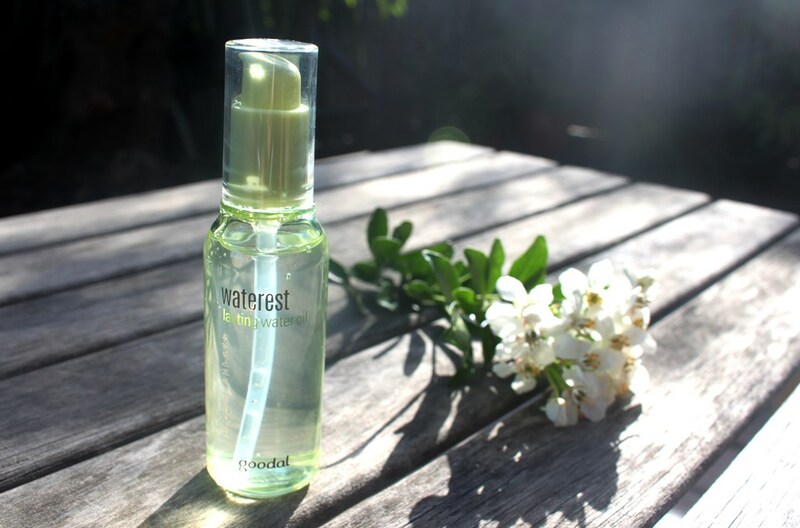 After using first essence or toner, dispense an appropriate amount and apply it to your entire face. 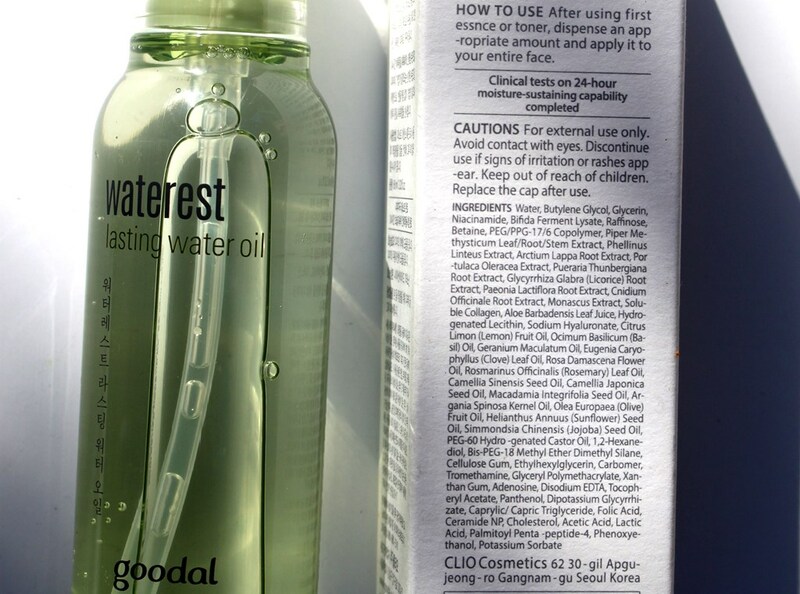 The 60ml bottle of Goodal Waterest Lasting Water Oil sells for anything between AUD$20.00 and AUD$40.00. This product is available online for Australian consumers. 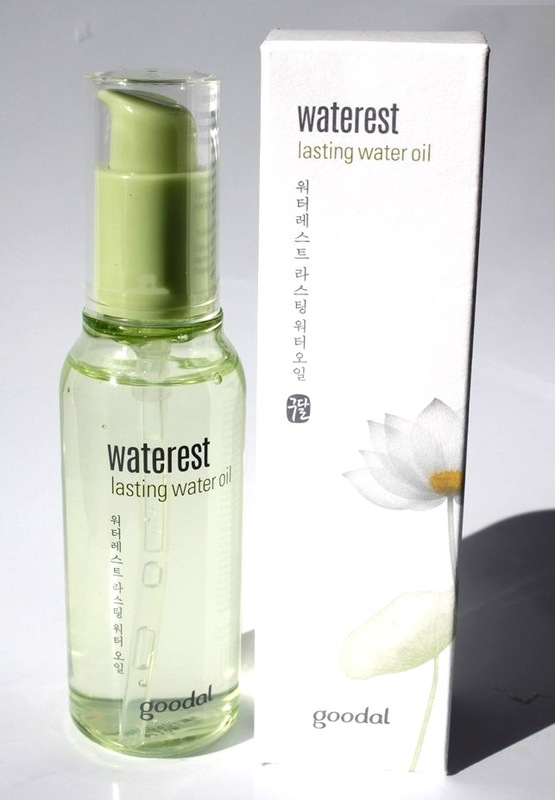 It sells at Korean skincare boutiques such as YesStyle and RoseRoseShop. The manufacturing date is printed on the bottom of the bottle although I am not sure of the shelf life of this product. However, suggested use is within 12 months of opening. 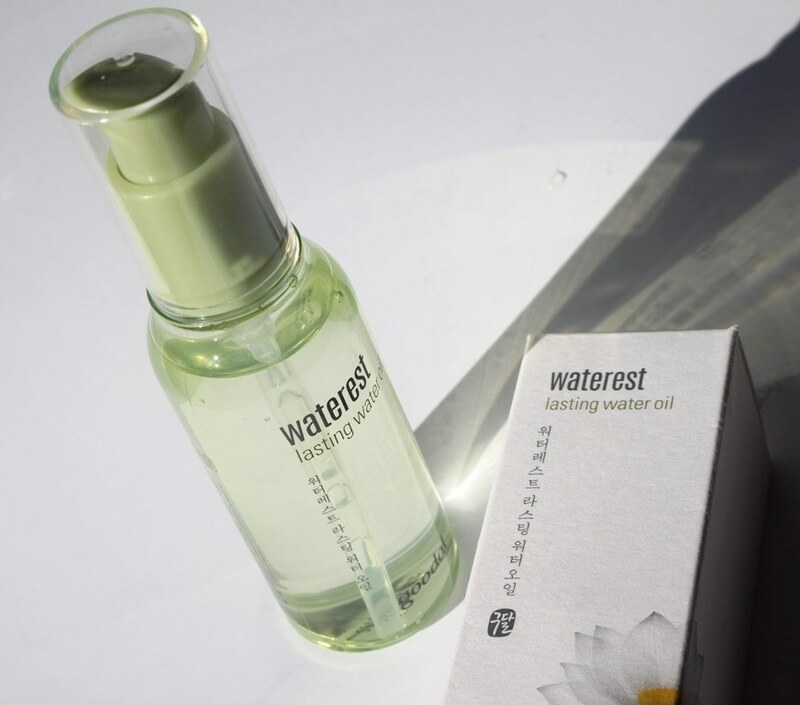 Nicely packaged and easily portable, the lasting water oil is compact and hygienically presented. One pump is sufficient to cover the entire face generously. Plenty of slip makes it easy to apply. The product consistency is as the name suggests, lighter than a typical oil but more viscous than water. It doesn’t leave any film or residue on the skin after application and is completely absorbed within seconds. 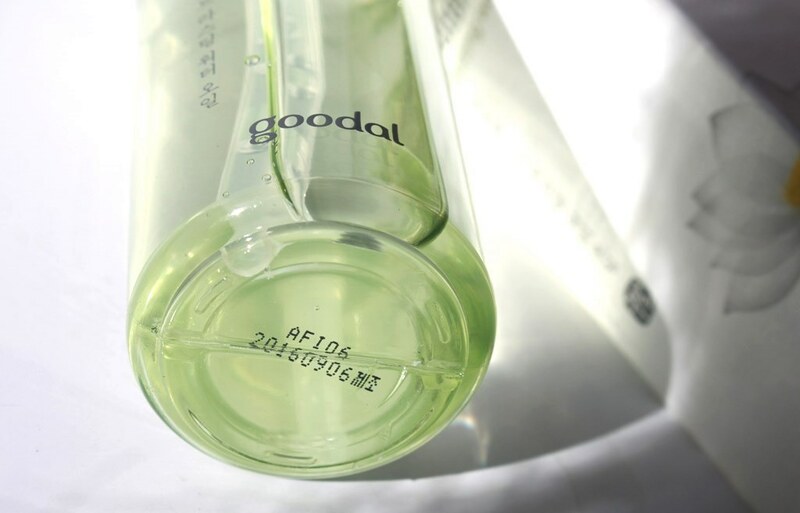 According to Goodal, it should be treated as a booster serum rather than an oil in terms of its position in the skincare routine, application recommended after cleansing and toning. As it does have a heavier consistency than my other serums, it felt wrong to apply this one first, even though it does sink in so thoroughly. Regardless, I used it after toner as suggested and I tried it after my other lighter serums too and found the results in both instances very similar for both the a.m. and p.m. routines. After this was established, I ordered the serums to reflect my priorities as no matter where this was positioned, it gave me outstanding results. It is highly compatible with other skincare, so didn’t effect any layers (including makeup) no matter what the order of application. The formulation is said to include a purified 7 Super Seed Fermented Oil (FC7) Complex which is broken down into micronized particles to allow for more effective skin absorption. This basically means fermented extracts allow for deeper nutrient penetration into the skin as the ingredients are micronized or finer. As a result, skin benefits are more quickly realised and last longer. And indeed, my skin feels completely and continuously hydrated when using this product. Evidence of this was particularly clear when I removed it from my routine for a few days. My skin lost some of its softness and suppleness and felt drier, even though I was moisturising and applying an oil complex in its place to compensate. Introducing it again, returned those benefits immediately. 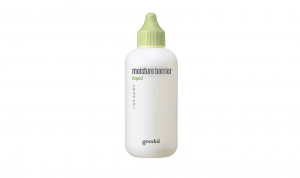 Reviewing the product claims, Goodal promises moisturisation and deep hydration that lasts 24 hours as well as brightening and wrinkle care. There is no doubt, the former is achieved and seemingly effortlessly. Whether these effects last 24 hours is anyone’s guess. My expectation for lasting hydration runs over a 12 hour window (between day and night routines). As far as I’m concerned, this is a sufficient and realistic duration over which to measure efficacy. I started applying this twice a day initially and in the final weeks of the trial, reduced that to morning only. I found that the same level of softness and suppleness was retained between applications whether I applied once or twice within the 24 hour period. However, I did top up on hydration via my evening routine (using alternate products) which would have assisted to keep my skin feeling supple between water oil applications. I have no intention of eliminating either my day or night routine for the purpose of testing the Goodal claims of 24 hour hydration. As even the simplest of skincare routines is applied morning and night, this is simply not a realistic scenario and unnecessary. Brightening is harder for me to quantify as this is not the only product in my routine promising this outcome. I am however very pleased with the current level of radiance in my skin. Wrinkle care is vague in terms of expected results. Given the fact that hydration plumps the skin and thus reduces the appearance of lines and wrinkles, it can be argued that this product delivers on this claim. However, I did not see any improvement in actual wrinkle reduction over the 5 week trial period. Delivering deep and lasting hydration to help keep skin supple and soft, this product easily belongs in the must-try category. 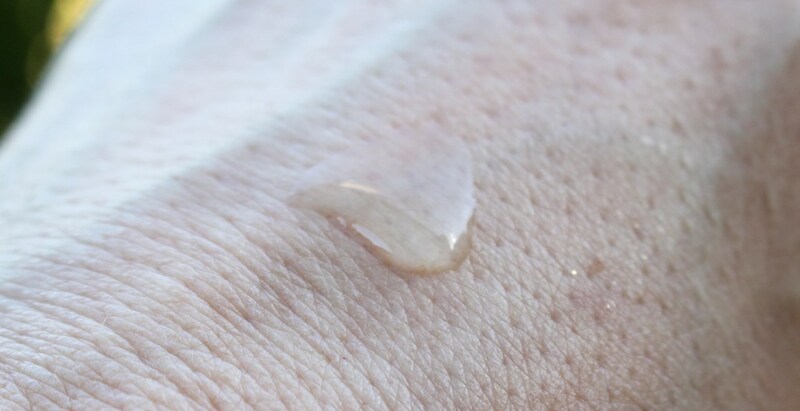 It is a skin saver for those suffering dry, dehydrated or dull skin and makes an excellent inclusion in any routine since it complements other products seamlessly. Due to some sensitizing oils, it would be necessary to patch test for those susceptible to such formuations. Its lightweight consistency and fast absorbancy allow the deep moisturising benefits of an oil without the greasiness. I will definitely be keeping this in my skincare stash ongoing and highly recommend it.